I often get emails from fans who want to know how they can create inexpensive meals on a very tight budget. Another concern is how to stretch recipes so they last for a few meals which amounts to a better bang for your buck. One of the biggest budget busters in the food department begins when you eat outside of the home. When you decide to eat out whether they are inexpensive meals or not you more than likely can always make it at home for less. Think fresh food, plus you know what you are putting into the food you eat when you make it yourself. You can’t put a price on that my friends. If you want to limit the temptations of the outside world you must be prepared ahead of time. I eat out from time to time but I certainly don’t make it a daily or weekly occurrence. The answer is to arm yourself with a meal plan and a grocery list that suits your tastes and fits your food budget. Not everyone knows product prices of the grocery store industry which is a number one factor when it comes to meal costing but also what meals to make with the ingredients they buy. It’s difficult for some people to set aside traditional recipes to look for something new so they stick with what they know. Life in the kitchen doesn’t need to be that boring though. Today I’m going to address how we create inexpensive meals on our $235 a month food budget for two adults and one toddler. If you want to stretch meals you have to create recipes that can go a bit further than one meal. Most often people think “Comfort Food” when they want to stretch a meal so they don’t have to cook the next day. Comfort food is food that typically hits the spot and includes fillings such as mince meat, eggs, vegetables and beans. One of the biggest challenges my wife and I have is creating healthy inexpensive meals that the both of us can eat, especially since she’s eating a low-carb diet. Most often I find that I’m thinking about meals I can create for the three of us which include all the food groups or what is allowable for my wife. Over the years we’ve created plenty of recipes that are budget-friendly meals which our family would eat over the course of a few days. Being a busy parents with a toddler we have to be on top of the meals or we end up not sticking to our meal plan. I am the first to admit that there are weeks where our meal plan is pretty boring or repetitive because like many others we go with what is familiar. If I have time off from work though this is when I try to create new meals to add to our recipe box so we don’t stay in boring food mode. Over time we build up a stash of recipes of inexpensive meals that we can make any night of the week without spending hours in the kitchen. Sometimes we boil up a dozen eggs and make egg salad to go along as a side dish to a meatless meal. Eggs are inexpensive and a great way to get protein into your diet. CBB fan Lisa C told us that the best part about making inexpensive meals in bulk is that”You only have to clean up once”, which is ideal for many families. She’s right! The rest of the week you will have general clean-up but nothing like batch-cooking night. Our go-to inexpensive meals that are easy to stretch always revert back to casserole type dishes and soups galore. Soup will always go a long way and you can bulk it out with a variety of proteins, vegetables and legumes. Whether you make soup in the crock-pot or on the stove-top you know that it’s difficult to make a small pot. I know I struggle but the leftovers are perfect for lunch or dinner throughout the week especially during the winter. When I go to work I always take hot meals with me which means at least once a week I need to batch cook since I work 7 days a week. There’s something about eating comfort food at work rather than a sandwich that makes me feel that I’m still eating dinner with my family. Being away from home for such long hours can make dinner time lonely. Typically, I don’t want to eat for dinner that night what I’m batch cooking for work so I try to prepare a meal that is easy that includes ground beef or other mince that we have in the freezer. I find that there are so many ground beef recipes that we can whip up in a flash provided we remember to defrost the beef. I’m horrible at remembering and my wife is no better. What can I make with ground beef? Whether you like ground beef, lamb, pork, turkey, chicken any one of these mince meats can be turned into inexpensive meals that will stretch your food dollars. Ground beef has been pricey the past year but that’s changing as prices have slowly been coming down. I also notice that grocery store butchers are packaging beef and pork mince together. This is a great option for those who want to make meatballs of any kind and it costs less. Any time we make meatballs whether for pasta sauce or in the crock-pot with a tangy sauce we use both pork mince and ground beef. The best part about using ground beef or other mince meats in bulk cooking is the option to add vegetables and other legumes to stretch the meal. Another trick we do is we batch cook pasta sauce which can later be used for chili, stew and even as pizza sauce for our homemade pizza pies. 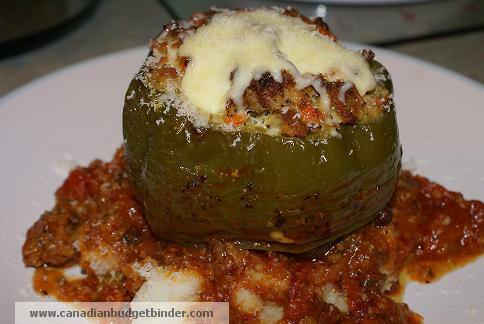 If you’ve got a load of peppers from your garden or you’ve found a great price at the grocery store stock-up and make a quick meal such as stuffed peppers which are delicious served with pasta sauce and dripping with cheese. One of our favourite meals is shepherd’s pie which is traditionally made with lamb. Lamb mince is very pricey in Canada to buy unless we can find it reduced which isn’t too often so we opt for using ground beef. We can typically pick up a pack of ground beef between $4-7 or even less if we were to buy a family pack of ground beef. I always run the numbers when deciding on what size package to buy because buying in bulk does have advantages most times. The grocery store knows that ground beef is a staple in most families so you will find meat and pork on the cover on at least one grocery flyer every other week or so. That is the time you will want to stock up so you are ready to create recipes that can take you through a few days without cooking again. A 10 pound bag of potatoes can cost around $2 when on sale which seems to be at least once a month or every other month. If you stock up with a couple of bags you’re good until the next sale cycle. 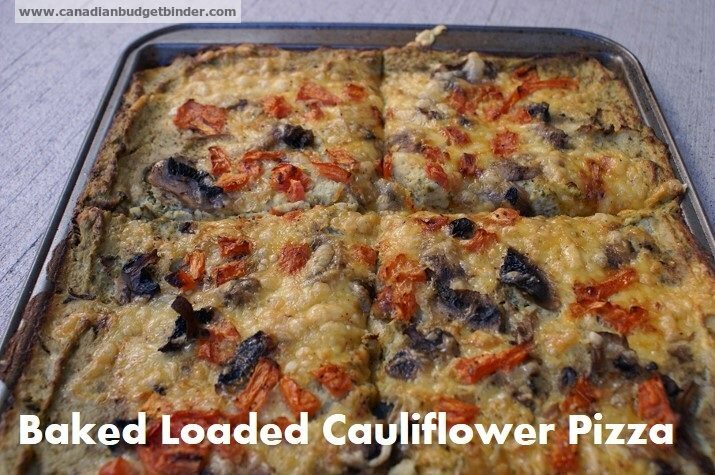 Another great topping for this type of pie is low-carb cauliflower mash or sweet potato mash if you want to switch it up the flavours. Common vegetables such as corn, onions, celery, carrots and peas are five produce items that help to bulk out a shepherd’s pie. You can even add black beans or chickpeas which are inexpensive to buy in bulk when dry. You can re-hydrate the beans in the crock-pot overnight without fuss which is what we do. Stop buying packets of spice mixes to make your one pot meals and I promise you’ll save some money there too. It’s so easy to make your own homemade taco seasoning, shepherd’s pie seasoning, sloppy Joe mix and so on with the ingredients you have in your pantry and spice cabinet. When we make shepherd’s pie we add spices that will bring out the flavour in the ground beef such as garlic, onion powder, thyme, sage, salt, pepper, bay leaf and Rosemary. As a thickener we use a bit of flour and water along with either ketchup or tomato paste for additional tangy flavour. It turns out great every time! I priced a shepherd’s pie for $13.99 at the grocery store but it’s basic on all levels and remember it’s not homemade. 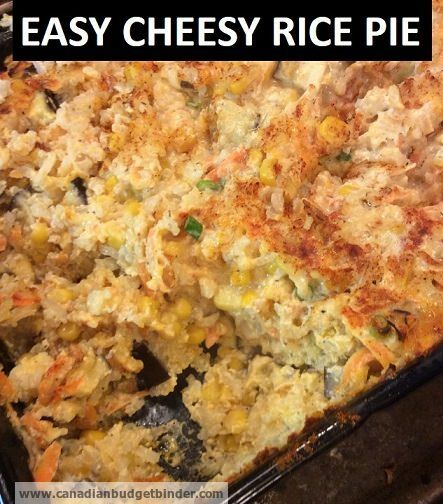 You can make a shepherd’s pie at home for half that price if you bulk it out with vegetables and use your own spices. When I make a pan of shepherd’s pie it will last for all of my lunch meals for the week or I divide it up with another batch meal that I make so I don’t get bored with my lunches. 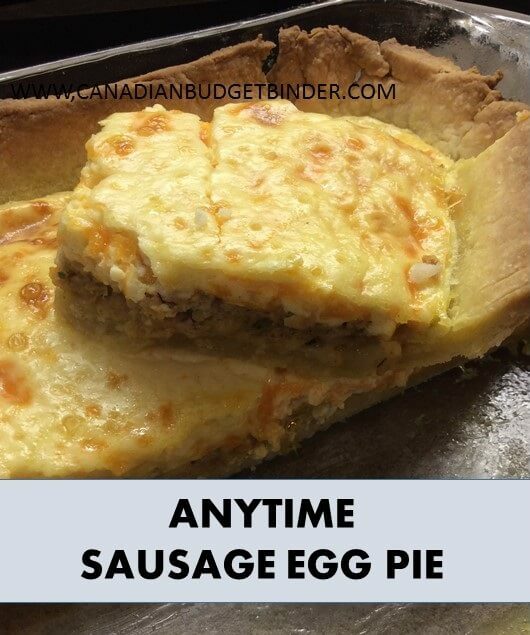 If you’re a fan of sausage you can also create inexpensive meals like a delicious casserole such as Nicola’s Anytime Sausage Egg Pie or my Toad in the hole. We all know that going meatless is a great way to stick to a food budget but not everyone likes meatless meals. Many times I’ve mentioned meatless and friends say that there is no way their spouse or kids would eat a meal without meat. Fair enough but if you want to stretch meals without the cost of meat, go meatless. 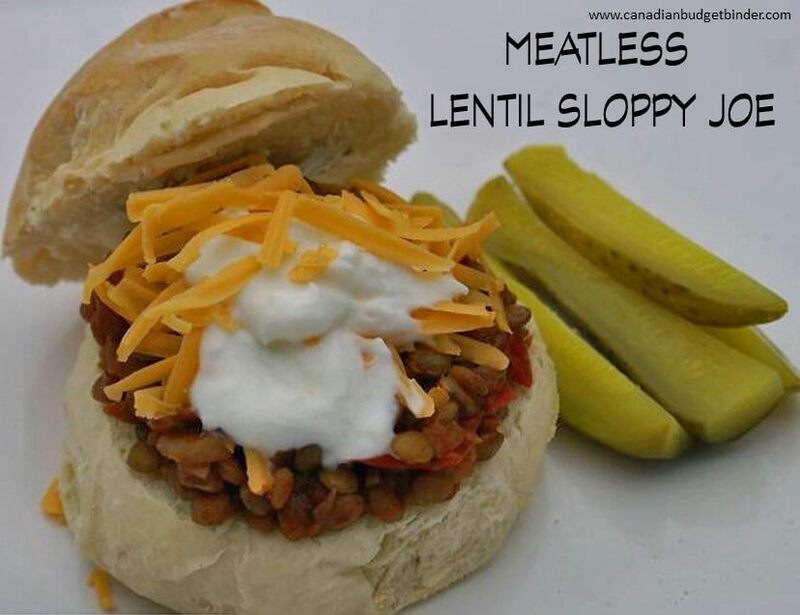 If you don’t mind them this is a great way to cut back on expenses and try new recipes that you may not have thought of such as my Lentil Sloppy Joe recipe which is a hit with many of my readers. 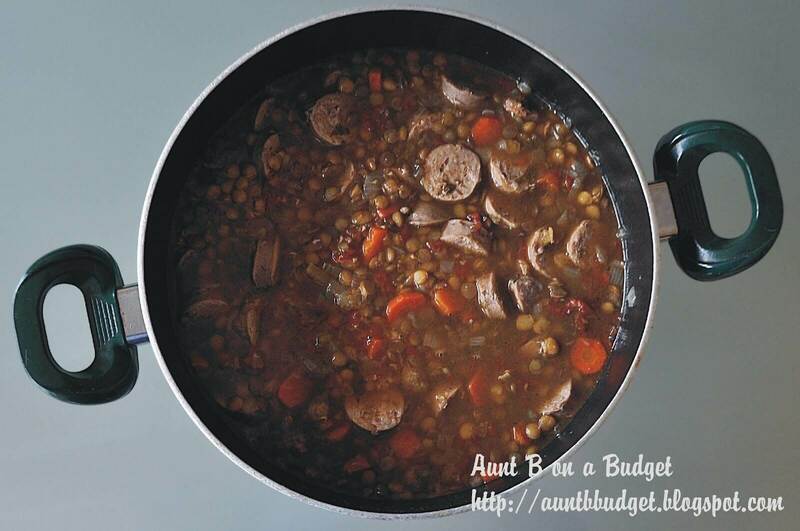 Lentils are inexpensive to buy and you can use them in a variety of dishes. I really do have some awesome fans at Canadian Budget Binder and when I ask them for feedback, they deliver. I appreciate the time they take to tell me what they do to create inexpensive meals which they can stretch over the week or even month when frozen. You heard it here first…. from the What’s For Dinner Gang!! Mary C-We only cook 2-3 dinners a week and eat leftovers the remainder of the week. 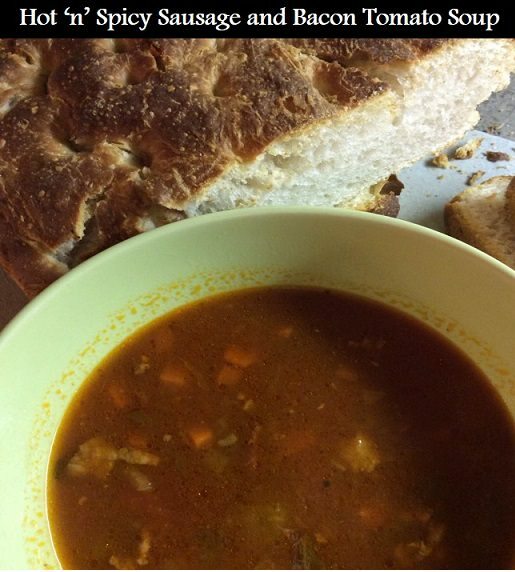 Soup is a great budget stretcher as are eggs, beans and lentils. Chandra- I stretch when making a roast or turkey or chicken, they go into stews, casseroles, soups. 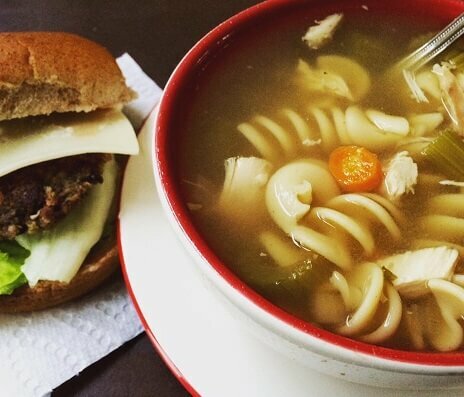 I made homemade slow cooker Swiss Chalet style chicken noodle soup tastes just like restaurant. And eating leftover homemade ground up portobello/black bean/broccoli burgers. Nicola D–Making big batches always helps. Stretches the pennies when needed. For example I made a huge taco tortilla lasagna yesterday and we will have the rest tonight with fries and a salad! Della F– One way that I stretch my meals is to take the leftovers for lunch the next day. Pam W- Soups and stews are a great way to stretch meals, unfortunately I’m the only one here who enjoys them. I buy pork roasts and whole chickens which I can usually stretch each to make two or three meals. Christine M- I cook a whole chicken for dinner and then the leftovers are used too – bones & meat for soup – I use the meat for sandwiches, or tacos, wraps, etc – I do the same for a roast beef and a ham. Also with leftovers I make a dinner plate of food and freeze it so when I’m in a hurry I take the dinner out of the freezer – pop it in the microwave and I have a healthy meal in no time. 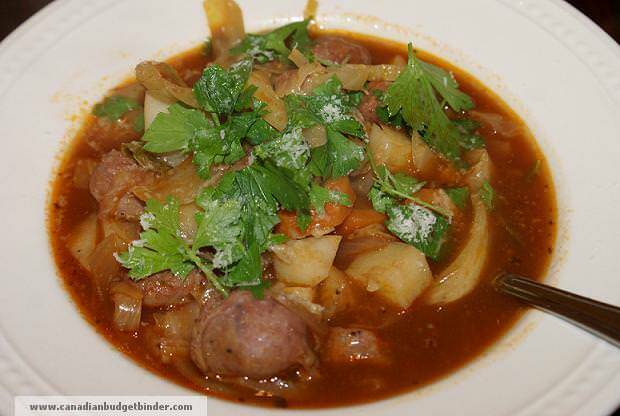 Donna M– I do not throw out any poultry carcass, I freeze for soups later on. 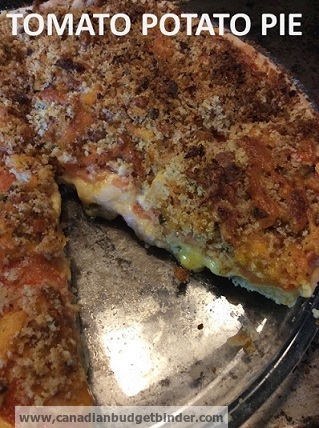 Mary D– I make leftovers which are great for lunches. I cook roasts which you can use the leftover meat for tacos, fajitas or sandwiches. Make a pot of spaghetti sauce it goes a long way, and easy enough to turn it into a pot of chili thru the week if you freeze a container of it. If you buy bone-in chicken you can use the bones to make your own chicken stock for soups. Colleen K- I still use a tip my mother used when there was 6 mouths to feed and not quite enough potatoes leftover from the night before she would cube up a couple of slices of bread and fry along with the potatoes in bacon grease of course. Before draining turnips stir in 1/2 tsp baking soda to help remove some of the gas…drain and rinse and mash as usual. Beth Anne- I’m the leftover queen. I plan leftovers and use them to make new dishes later in the week Other ways I stretch meals are by including more vegetarian meals in my menu plan and by using less meat and more grains, legumes, and vegetables in the meals that are not meatless. I also make stock every week and, if I’ve made a large quantity of any dish, I either freeze some of it or can it for later use. That way I don’t get too bored with it. 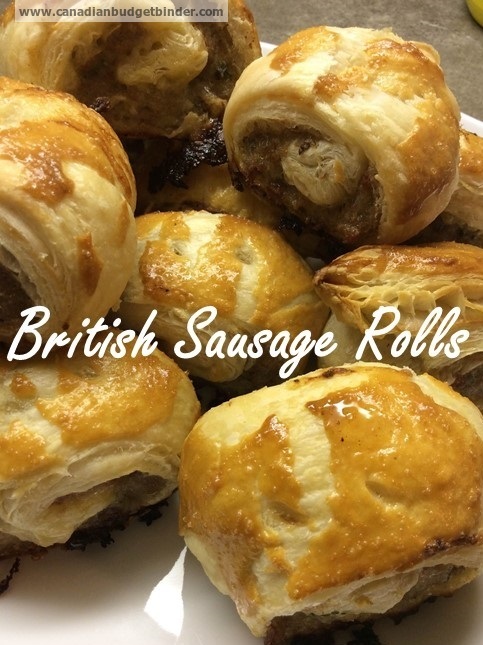 Christine W– I try to stretch any meat we have. If it’s a small roast I try to get 2-3 meals for the 4 of us out of that roast!! I work to use up any leftovers somehow as a lunch or another dinner or part of the next meal. Meat is expensive so I don’t serve a lot of it, more potatoes and veggies than meat for us! Judy C– To stretch meals I try not to throw anything out, make leftovers into something new, hubby takes leftovers for work lunches, and we’ll have soup more often. I also find It goes better if I write out a menu for the week. Pat C– To stretch the meals when I am home, I cook a big dinner like a roast chicken or roast beef, ham, etc. Then I de-bone and divide into portions for future meals. Then boil the bones to make broth. The leftover veggies go into the soup. I also make extra of foods that freeze well like rice and beans and portion them as well. Finally, I just want to add don’t if you do decide to make a large batch of food do leave yourself enough time so you’re not rushing. If you enjoy the process of cooking you are likely to repeat it which means more savings for your grocery budget. 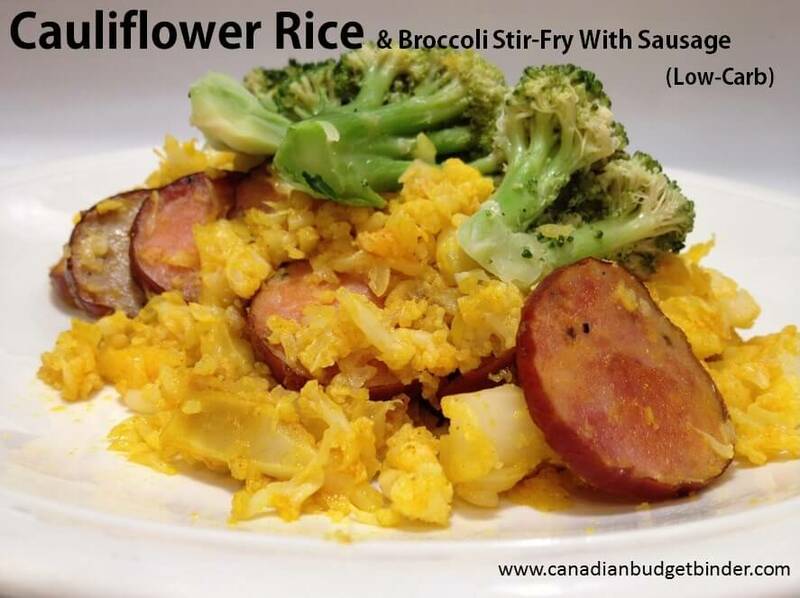 What other ways can you think of to stretch inexpensive meals so they last a bit longer? Join in the 2016 Grocery Game Challenge (GGC) fun and post your grocery shop in the comment section of each GGC blog post. Here are the rules to get you started and where you’ll also find a link for the updated 2016 GGC schedule. Please feel free to download, save and even print the schedule so it’s handy. Thanks to Mary for putting this together for us again this year. If you need any help please let me know. New monthly prize: $10 President’s Choice Gift Card for Canadian residents only BUT If you want to play from outside of Canada and have PayPal and you win I will pay you $10CDN. I use a random online generator to pick the winning ballot every month. If you missed any grocery game posts for the month I will post the line-up each week below for you so you don’t have to go looking for past GGC posts for the month. Alternatively, just click on the “Grocery Game Challenge” tab on the blog side-bar to see past posts. 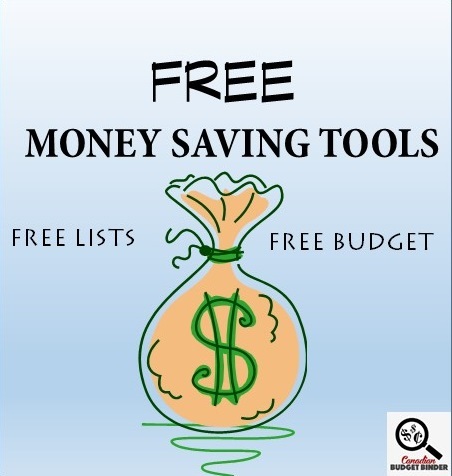 I know I blast you every which way I can on this blog about my free money saving tools and that’s because I want you to take advantage of them being FREE. So many people pay for budgets and tools on the internet to help them save money and honestly you don’t need to. Even a paper and pen will do the trick. You can download the FREE Canadian Budget Binder Budget Spreadsheet in Excel…Grab it while you can… It’s FREE! We use it to budget and in large part a reason we could pay our mortgage off in 5 years, check it out! 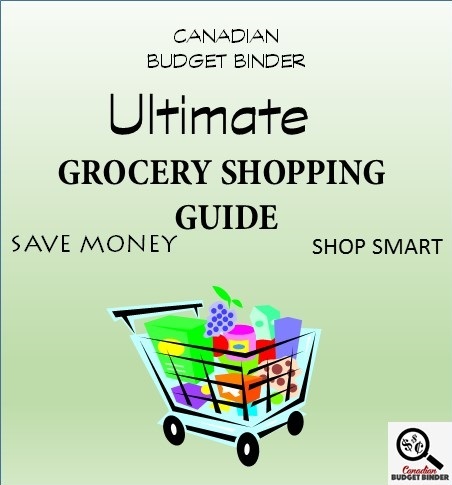 Everything you want to know about grocery shopping in Canada is packed into this amazing FREE grocery shopping guide that has taken over 4 years to create. Total over/Under spend for the month:- over budget $217.05-$249.46=$32.41 over yikes!! Wishful thinking that we would come under budget this month and we would have if not for some amazing sales and that we roamed around the store. We were trying to waste time before our sons vaccination appointment so he wouldn’t fall asleep, of all places. In doing so we found some great 50% off deals which saved us $27.87 had we paid full-price. All of the items we bought are typical of our grocery budget or foods we would only buy on sale. I was particularly happy to find the lamb mince, Homo Milk, yogurt and free range eggs for reduced prices. We would never spend $6.99 to buy a dozen but for $3.29 we’ll give it a go. Why not, they taste better. Overall, we have a carry over for next month. Avoidable-probably. Although we are still buying reduced items as much as we can we will re-evaluate our grocery budget come the middle of the year to see if it’s US who is being naughty or the grocery prices. Time will tell. How was your grocery shopping week? Where can I find Canadian Coupons 2016? Grocery Game Challenge RULES: Read the rules first and if you have any questions email me or comment on this post with your question and someone will answer you as soon as possible. The rules have been updated for the 2016 challenge year. Welcome to The Grocery Game Challenge 2016! I totally forgot to leave a comment when I posted! Little miss is the big blueberry eater in our house…..she would and could eat a container in one sitting if you let her. I have enjoyed being able to buy more fresh fruit and veg this year since we have our stockpile of items downstairs we don’t need to buy items like shampoo, cond, laundry soap, dishwasher tabs and a few other things. But with saying that if I can get it for .50c or just the tax I will buy stockpiled items so I can do some donations. I get pretty frustrated and rushed sometimes at the till and maybe need to force myself and the cashier to slow down. The dove mens coupons are from an insert maybe last year……it had a strip of dove men asstd coupons and $1 Palmolive dish soap in it. Great price especially since I will use almost all of them for donations! Walmart: Coke zero pk 3.47, corn pops 3.88, hunts pudding 1.00, powerade 2 x 1.00, bananas 1.03, tax .71: Total paid 12.10 rounded up 1 cent. So a great month, and a perfect way to compensate for January’s expensive month. We managed to only spend 114.95 for the whole month and that left us making up ground of 135.05. We still hope to have the remainder made up by the end of March. It will be close, but possible, not much more to go. A lot of the food was for a hockey weekend away so that we could eat more in the hotel rather than eat out. We did two meals with the hockey team and spent about $80 for those two, and a quick takeout of $10 because we had to throw in an additional on the road game that we didn’t anticipate. It worked out really well. There was a continental breakfast, but so many people were sick and coughing all over the food we were really glad we had brought a lot of our own stuff. Our son ended up quite ill regardless, so I am glad he didn’t have that extra exposure. Thankfully it was an illness and not food related, so we saved ourselves and emergency trip and he got to finish out his weekend. The pop was for easy portable drinks aside from water and powerade for our son. In three days he played 5 hockey games (missed one for the fever). I don’t encourage the powerade often, but with that amount of exertion I allowed it. I figure at 10-years-old water is enough. In the end, I am glad I did based on the fever that he ended up with. Glad dehydration wasn’t part of it. Regardless, it was a fine weekend and a great deal of fun and bonding. We also used the opportunity to replace some items that we would pay more for or not fit as well from our town while in Ottawa. Our son had hit a major growth spurt and went from a size 4 shoe to 5.5, so we needed shoes desperately. Also, he needed a new hockey helmet, but it was properly fitted. Leftover foods came home with us and that got us through until grocery day. So happy we prepared for an away trip. We usually do, and I won’t stop! Great month!!! The frozen chicken balls are just like the Chinese takeout ones except they didn’t come with the sauce, so we used the sweet and sour sauce we had in the fridge. It’s a cheaper version of the takeout, convenient, and without the hassle of trying to make them. I do want to try to do this at some point, but that will be an experiment for the future. Our son also grew quickly with his feet in the early years, he was in a size1 by JK, however, it did level off and become more slowly growing from grade 1-4. In the last year we started jumping sizes again. I figure he’s due to sprout up again lol. I couldn’t imagine doing a road trip without the food prep ahead of time. The hotel stays are expensive enough, I couldn’t imagine adding constant eating out to it too. Our family went to Pennsylvania two summers ago and got a hotel room with a kitchen in it. We left home with a full Rubbermaid container of food (all allowed to cross he border – we checked first) and then just bought the fresh produce and meat there. Good thing too, we found groceries ridiculously expensive there like pasta, bottled water for the amusement parks we were going to, cereal, rice, condiments, all of the dry goods we brought with us), eating out the whole time would have been ridiculous. This hotel also had a continental breakfast, but served cantaloupe so what we got there was extremely limited and we asked staff to directly bring things out to us like milk and yogurt containers so that the cross contamination wasn’t an issue. They were lovely. But, in reality, the food we brought with us was the most helpful. Besides, growing up, my family brought snacks with us, food even depending how long we were gone, or stopped at the grocery store. My parents are a big part of my influence for taking food while travelling, it’s just what we did! I don’t even know how kids size shoes work yet so I should probably research that. Yes, we always prep when we go on a road trip so we aren’t spending any more than we need to. It’s so easy to say sod it and eat out. Made it under again. This puts me just over $90.00 under for the year. This might come in handy later in the year so I will hang onto it as long as I can. The outside round roasts were a nice price considering how pricey beef has been, $3.99 lb. the Air Miles discounts were nice to have too. I get an email with those every week from Foodland and Air Miles just like with the PC Plus offers and Shoppers deals and I load every one just in case!! Yes we had the apple onion sausage and it was very nice. You could smell the onion when I opened the package, even frozen. The onion taste was mild eating it but you got a bit of the apple sweetness at the end, almost as an after taste. I will be looking for that kind again as we all enjoyed it!! Lots of recipe this time. 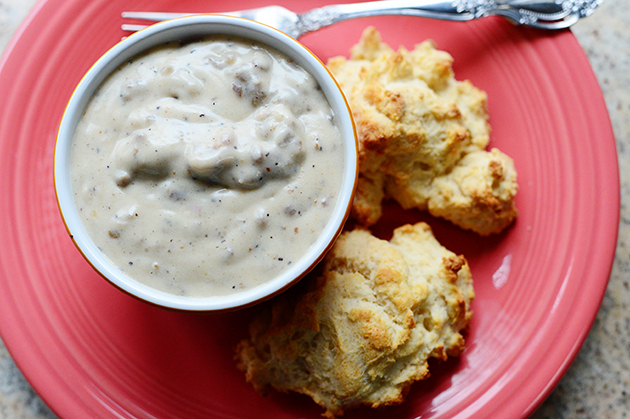 But, what got my attention is drop biscuits and sausage gravy. That sauce looks creamy and must be delicious. Personally, I think the cheapest, meals are meat, potato and a vegetable. Exactly and I wrote about that a couple of years ago. We are eating too much and that is costing our wallet. Thanks for the comment Kathryn. •	Total under spend for the year: 145.15! •	Weekly Overview : Great air miles this week! I had a 150 air miles coupon if I spent $125. Plus 30 air miles if I bought 3 butters. Plus extra air miles on the bread, ice cream, tortilla chips and pickles. My meal planning consists of me making a list of meals based on what I have in the freezer and pantry. Then as I make the meals I cross them off the list. 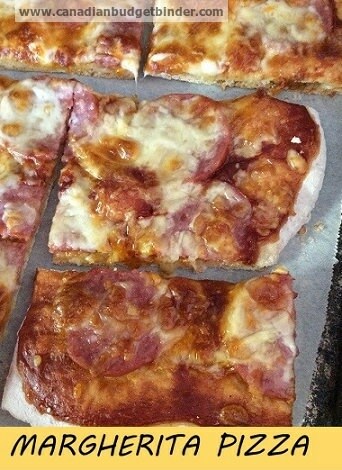 So For next week I have a choice of- Pizza, chowder, oven roasted ham, curried chicken and rice, spaghetti, Lentil soup, ham and potatoes, ham quiche, ham fried rice. Ok I am a bit confused, isn’t this shop for March? Yes, I used the air miles coupon to get the mega air miles deal. Yes, I am OK buying non-organic, but I am always extra happy if it is organic. Our grocery budget has been through the roof since we started eating Paleo/Whole 30, especially since it emphasizes organic foods and grass fed beef. We feel better health-wise, but it does take a toll on our budget. May I ask how much you spend each month on groceries? Growing up my mother always made shepherd’s pie …cooked hamburg and couple cans of condensed vegetable soup…mix together…plop in a baking dish…top with mashed potatoes…pop into oven until bubbly around the edges. Do the above for each receipt you have then copy the template below and paste it to the bottom of your shop so we can see your results. Weekly Overview (your final thoughts): Tried a couple new fruit/veg markets while in Halifax area, and the place was standing room only…literally.Got some amazing deals..especially the strawberries.Got another great price cheese blocks. Expect next month, our spending to be even lower. Yes, always head for the reduced produce and meat sections first…then back track and start over again, as many times they will have Manager’s Specials or discount stickers peppered along the way. I have found that my daughter and I have an informal barter system…she has too much of one thing, and we trade food items, which benefits both of us. We don’t eat a new meal every night. I had a leftover meat patty and mashed potatoes, and with all the talk of Shepherd’s Pie this week….that transformed into another meal. Breakfast is usually the same rotation…eggs of some sort, or a hot porridge….with fresh fruit, toast and tea. Supper is usually meat of some sort, potato cooked a variety of ways, a fresh veg, and possibly a salad. $10.80 I underspent and carried over from January and February. I was thinking that next year I might adopt Mary’s idea of a reserve budget to cover the cost of entertaining on holidays. It probably reduces some of the stress. I really liked your post this week, Mr. CBB. As you and others pointed out, batch cooking can really save money because there is something already prepared so it is not as tempting to grab something on the go. One problem I have with it though is that I can’t prepare large quantities of foods I really love because I will overeat them. I had this happen last week when I made crustless broccoli and bacon quiche. It was really enough for 4-6 servings but got eaten in two meals. The things I’ve had the most success with are things like bean/lentil dishes, soups,or individually portioned cooked meats which are good but not good enough to eat a lot of. With regard to low cost foods, soups and stews are awesome and filling enough to prevent overeating. Pea and lentil soups are dirt cheap, full of nutrition, and extremely filling. It’s hard to imagine a cheaper source of protein than orange lentils, split peas, or tofu. Even eggs and dairy seem pricey in comparison. When I first started thinking of low cost foods to cook I started looking for ethnic recipes because I thought they’d be both nutritious and good. Its hard to beat hummus and Indian lentil soups for example and they’re so easy to make in usually 1 pot. Tofu is also incredibly cheap. There is 2/3 the protein in a block of tofu that costs a dollar as there is in a dozen eggs that are usually two to three dollars. The texture can be gross if you buy the extra firm variety but the regular and firm are usually okay. I like it best fried in a pan coated with cooking spray then put in a bun and topped with PC peanut sauce and veg. It’s also great in a stir fry or asian style soup. Out of curiosity, how is everyone planning to keep costs down over Easter? I have lucked out a time or two getting ground pork reduced that I mix into the ground beef here. My local store has never sold the two mixed together. I’ve found ground chicken and turkey here too that is reduced. I grab it fast when I find those deals! With the size of the batch of spaghetti sauce I make, there usually isn’t that much leftover so I freeze it to use later with some frozen from another night. Usually gets used in a pasta bake like penne or tortellini. My shepherds pie is a cleanup of the leftovers from a roast! I’ve never tried making it from ground beef…. All in all some very good ideas to stretch the grocery budget!! I found Freshco or No Frills that will sell ground port/ground beef mix, usually a 60/40 split. That’s great for one person or a couple who want to make a meal but not buy a pound each of pork and beef. What a brilliant idea Beth. 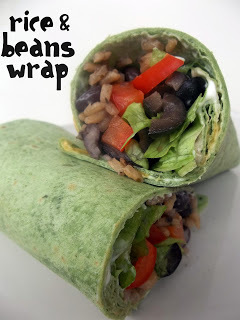 We love lentils, black beans and chick peas and often eat them in our house. I may give this a try once the wife is back on eating beans. I am going to try and make up for the overage next month by spending approx.. $30.00 less per shop. If I don’t catch up next month I am thinking that when the garden starts producing and some of the prices go down in the spring/summer I should be able to make up the difference. 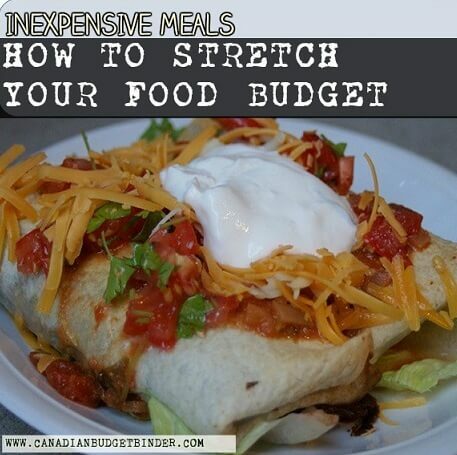 I think it will help a lot of people looking to stretch their meals and budgets. I find it interesting that many stores sell a beef and pork blend and wonder if it is processed by an outside company. My store would fail the santitation audit with the possibility of getting shut down for mixing the two meats together in the grinders because they would now be contaminated. We have a small machine to grind pork and a large machine to grind beef. Also many people that shop our store either dont eat pork or beef due to dietary reasons or religious beliefs. This is a LOW SHOP WEEK for the last week of the month. I needed milk so we bought a jug of Island Farms at Thrifty Foods with the $5.00 Facebook coupon I had. I love getting the milk for FREE! OUR NEXT USA SHOP WILL BE LATER IN 2016. THE VALUE will be added month to month to our Holiday Reserve for next Christmas. OUR CURRENT TOTAL UNUSED RESERVES ARE $899.27. This means the $936.51 that we carried forward from 2015 PLUS AN ADDITIONAL $183.10 that we have added in 2016, LESS $220.34 that we have drawn out for use in 2016. Overview: Well to attempt to make up for the overage, this week is my last shop for my “February”. I received my Chapman’s Ice Cream coupon in the mail so I scored a nice deal on the ice cream this week. To make up for the shopping over the past couple of weeks, I have enough food to make it last, except for minor things like milk and bananas. I have one more week under my “February” because of when I get paid. I don’t buy cinnamon raisin bread unless it’s under $2.00. I need to try and make it from scratch. Next week will be a no shop for the humans but will have to get the cats a few items.